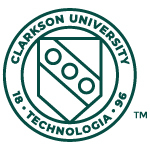 Clarkson is the nationally-ranked research university of choice for more than 4,200 enterprising, undergraduate and graduate students pursuing degrees in over 60 rigorous academic programs of study. Clarkson produces remarkably effective engineers, scientists, health professionals, business people, educators and creative leaders who easily engage “What's next?”. We educate leaders who defy convention and move the world forward. One in five alumni leads as a CEO, VP or equivalent senior executive of a company. Potsdam is a classic college town with an array of modern stores and restaurants. The University's contemporary academic and residential facilities offer splendid views of the beautiful Raquette River and the Adirondacks. Clarkson�s Office of Campus Safety & Security works with the campus community to promote a safe campus in which to live, learn and work.